There are a number of ways to access WiFi networks while using the University of California, Berkeley Libraries. Depending on the user's status, these services can wirelessly connect users to licensed library resources as well as the full range of publicly available internet resources. UCB students, faculty and staff - AirBears2 - CalNet ID and AirBears2 key required to set up connection. Access to licensed library resources is available via AirBears2. Visiting scholars who are registered with the Visiting Scholars and Postdoc Affairs (VSPA) Program - Obtain a CalNet ID from sponsoring department to access AirBears2. Access to licensed library resources is available via AirBears2. Students, researchers and staff from other educational institutions - Eduroam WiFi which allows researchers from participating institutions campus Internet connectivity. Access to licensed library resources is available via Eduroam. General Public including Cal Alumni -CalVisitor WiFi which is available for visitors to campus -No password required. Access to licensed library resources is not available via CalVisitor. AirBears2 provides authentication and improved confidentiality for data being transmitted wirelessly. The secure automatic connection means that users only login once. The encryption of wireless data traffic improves security. AirBears2 requires several steps to configure before it can be used. These steps include creating an AirBears2 key and configuring your computer or Device to use AirBears2. 1. Creating Key - Use your CalNet Passphrase to login to the Manage My Keys website and follow the instructions provided. See additional information on managing your AirBears2 key. 2. Configuring Your Device or Computer - Once you have created your AirBears2 key, it is necessary to configure your device or computer to use AirBears2. To do this select AirBears2 as your WiFi network, accept the certificate that is offered (this secures the association process), and log in with your CalNet ID using your AirBears2 key as the password. Once you have done this the first time, your device should automatically use AirBears2 whenever you are within an area that it is provided (inside almost all Campus buildings). 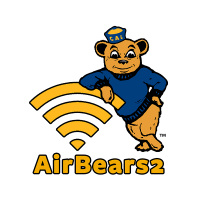 For step-by-step information on how to configure your device for AirBears2 go to Learn More About AirBears2. For assistance in using AirBears2 contact ISTSupport. eduroam (education roaming) is world-wide roaming access service that allows students, researchers and staff from participating institutions to obtain Internet connectivity across campus and when visiting other participating institutions. 1. Use your AirBears2 Key or Create a Key. If you already have an AirBears2 key you can skip this step. To create a key, use your CalNet Passphrase to login to the Manage My Keys website and follow the instructions provided. Connect to the eduroam SSID, and provide your CalNet ID @berkeley.edu as the user name, for example if your CalNet ID is oski, you would enter "oski@berkeley.edu." Enter your AirBears2 WiFi Key as the password. Once you have done this, your device should automatically use eduroam whenever you are at an institution that provides it. Visit eduroam.org for more information about this service. For assistance in using eduroam contact ISTSupport. CalVisitor provides a basic level of WiFi access for those without a CalNet ID. This free service is intended to support the Internet access needs of campus visitors. To access CalVisitor, simply configure your WiFi enabled device to select CalVisitor as the SSID for your wireless networking needs. No password is needed. CalVisitor allows visitors to access their email and the Internet but does not allow access to licensed library resources. Visitors must continue to use the public PCs in the libraries to access licensed databases and journals. WiFi Printing at the Library. Browzine- a service for accessing current issues of scholarly journals licensed by the Library. Things to know about using AirBears2. 1. To use AirBears2 it is critical that you create your AirBears2 Key before you attempt to configure your device or computer. Information on how to create your AirBears2 Key go to Manage My Keys website. 2. Step-by-step information on how to configure your device for AirBears2 can be found at Learn More About AirBears2. UC Berkeley provides CalVisitor as a convenience to visitors. No support is offered for devices or users with difficulty accessing the service. Any malicious activities on the network will result in the offending device being permanently banned from the network. Compromised devices (infected with viruses or other malware) will also be permanently banned. Bans are automatically implemented and can not be revoked. Because CalVisitor is a public network it should not be used for any type of sensitive data. SSL, VPNs and other encryption technologies may be used by client devices to improve confidentiality of data sent via this network. There is a known issue with Apple devices (iOS, Mac OS) if they try to switch services (i.e., SSIDs) on the University's wireless network. The network remembers you and the service you were on. For example, if you were on AirBears2 and try to shift to CalVisitor, you may receive an "Unable to Join" message. The workaround is to turn off your device's WiFi service, wait for 10-20 seconds, and then turn it back on and reselect your network preference. For iOS devices, you may also try to disconnect from your current WiFi network by using your device's "Forget this Network" feature (Settings -> Wi-Fi -> name of the wireless network -> Information icon -> Forget this Network).